Have you ever used a tortilla maker? Not a tortilla press, but a tortilla maker that presses and cooks tortillas to perfection? I bought a Sachi tortilla maker off of EBay a couple months back and haven’t purchased a single package of tortillas since. If you’ve never had a warm homemade flour tortilla before, you’ve got to try this. I find myself stuffing tortillas with all kinds of strange leftovers these days. Like left-over cheesy scalloped potatoes, tri-tip, and hot pepper sauce. Or a mixture of potatoes, peppers, onions, sausage, and eggs for breakfast. Then there is always the quick quesadilla lunch I can press right in the tortilla maker. When we make tacos I have a fantastic new go to recipe from Cook’s Illustrated for taco meat. Cook’s also has a recipe for frying up your own crispy corn taco shells which I’ve included for you. If you use shortening in the tortillas instead of the olive oil I used, you may not need to press a second time. I wrote the instructions for two pressings, which removes the excess liquid. You’ll have to play around and see what you like best. If you buy a tortilla maker, make sure you get one with temperature control. You’ll need to cook the tortillas on a lower setting during the first press so that the pressure from the heated liquid in the dough doesn’t blow the tortilla into pieces. Trust me on this one. I wasted many a tortilla before I got the hang of it. You won't have to go through that with these instructio ns. Soon you will know what it feels like to turn up your nose at grocery store tortillas and save a bundle of money all at the same time. 1. Pick either the flour tortilla or whole wheat tortilla recipe. 2. In a food processor add the flour, oil or shortening, and salt. Process for several seconds. Then add the warm water and process until a ball forms. 3. Remove the dough from the food processor and knead in your hands several times. Place the dough in a small bowl and cover with foil. Let the dough rest on the counter for at least 30 minutes. 4. Turn the Sachi tortilla maker ¾ of the way into medium heat and brush lightly with oil (Don't use non-stick spray). Knead the dough a couple times and divide into 10 or 12 balls and press slightly to flatten. 5. Place the dough balls one at a time into the back middle of the iron. Press for about 20 seconds and check for doneness, flip if needed. Remove the tortillas when they are no longer wet looking, but not browned at all. Repeat with the remaining tortillas brushing the plates with oil as needed; place the cooked ones on a plate. 6. Turn the tortilla press to the middle of high heat. Take a cooked tortilla and re press until no longer wet looking and the steam nearly stops coming out of the sides. Be careful not to brown or your tortillas will be crispy instead of soft. Repeat with the remaining tortillas. 7. Let the tortillas cool for a few minutes on a plate and then pull apart and restack to make sure they stay separated. Store extras wrapped in foil in the refrigerator. Makes 10 to 12 tortillas. Cook's Illustrated Note: Tomato sauce is sold in cans in the same aisle that carries canned whole tomatoes. Do not use jarred pasta sauce in its place. We prefer to let diners top their own tacos with whatever fillings they prefer. There’s no need to prepare all of the toppings listed below, but cheese, lettuce, and tomatoes are, in our opinion, essential. 1. Heat oil in medium skillet over medium heat until hot and shimmering but not smoking. Add onion and cook, stirring occasionally, until softened, about 4 minutes. Add garlic, spices, and ½ teaspoon salt; cook, stirring constantly, until fragrant, about 1 minute. Add ground beef and cook, breaking meat up with wooden spoon and scraping pan bottom to prevent scorching, until beef is no longer pink, about 5 minutes. Add tomato sauce, chicken broth, brown sugar, and vinegar; bring to simmer, uncovered, stirring frequently and breaking meat up so that no chunks remain, until liquid has reduced and thickened (mixture should not be completely dry), about 10 minutes. Adjust seasonings with salt and pepper. 2. Using a wide, shallow spoon, divide filling evenly among prepared taco shells; place 2 tacos on individual plates. Serve immediately, passing toppings separately. The taco shells can be fried before you make the filling and rewarmed in a 200-degree oven for about 10 minutes before serving. 1. Heat oil in 8-inch heavy-bottomed skilled over medium heat to 350 degrees, about 5 minutes (oil should bubble when small piece of tortilla is dropped in; tortilla piece should rise to surface in 2 seconds and be light golden brown in about 1 ½ minutes). Meanwhile, line rimmed baking sheet with double thickness paper towels. Ground beef taco filling and fried corn taco recipes from "Cook's Illustrated Special Collector's Edition All-Time Best Recipes 2009". Tortilla recipes from the Sachi booklet with rewritten instructions by Laura Flowers. Pictures by Laura Flowers. 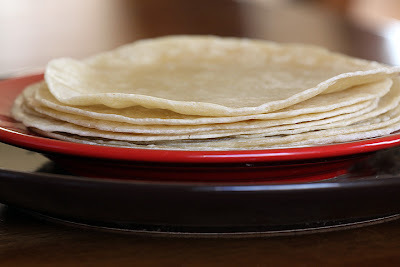 I love making and eating homemade flour and corn tortillas (especially with butter!). I've never seen a tortilla maker. I just have a tortilladora (or tortilla press) for my corn tortillas. Anyway, your beef tacos look scrumptious! Please come and make me dinner!!! My grandma used to make homemade flour tortillas and I loved them! I LOVE mexican food! I do not own a tortilla press but have used one in culinary school in the past. I really should invest in one, your post makes it look delicious! That is such a cool tortilla maker. I would love to try homemade tortillas! Hot off the press fresh! I have never seen that one..Looks like fun..I would be proud:) Great pics as always! Great Poat Laura!! I have not ever heard of a torilla maker!!! I will have to check them out!!! I grew up in Texas, and we lived practically in a predominate Hispanic neighborhood, so my mom learned how to fry corn tortillas and make authentic Indian-Spanish taco filling...gosh now I want some! I will have to shop on EBay too, I have never seen a gadget like that around here!! 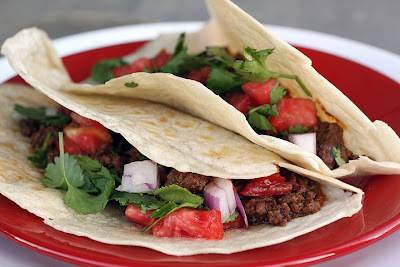 Your ground beef tacos look so fresh and healthy, yum!!! Ciao Laura!! è sempre un piacere passare nella tua cucina!! trovo sempre dei piatti molto belli e invitanti!!! bravissima!! ciao ciao!! Ps. scusami tanto non so l'inglese! Interesting! I'm not happy with the flour tortillas I get in my supermarket. Maybe I'll have to get a machine like that one day! For now, I'll try your beef fillings. Yum! Very nice! Congrats on getting published on Tastespotting.com! Is the surface of the tortilla maker teflon - non-stick surface? Now I'm impressed :-). Tortillas from scratch? These are gorgeous. As we speak, I am searching ebay for one of those tortilla presses. What a great idea! I hope you found one. I tried to go visit you, but being out here in the deep country today might be blocking me from any site I really want visit. Grrr.. I'll try again when I get home! Darn you Laura... now I'm thinking life isn't complete until I purchase this contraption. I need it like I need a hole in the head. I usually buy mine but they have to be better homemade. Thanks for sharing. This looks like it would be so much fun to use. How cool! By the way, there's an award waiting for you at my blog. First, thank-you! And second. I tried to leave a comment twice on your blog and it didn't show up on my end. Let me know please if you got them. Patricia you need one of these. NEED. Seriously. Even you amazing Italian American types need one of these things. I've never made a tortilla. Your post makes me wonder why not? Love your details and your photos are wonderful! Oh man, I totally need one of these! I use tortillas for wraps all the time. So much money I'd save! I have truly never seen one of these machines but now I want one. I love tortillas and everything you can possibly fill them with - like you scrumptious-looking beef tacos. Yum! You always make me hungry! Thanks for your recipe and tips (mine always explode - but now I know how to fix that!). That means your tortilla maker is too hot. Can you turn it down? If your's doesn't have a dial try unplugging it when your tortillas start getting too crispy. I had the same problem. It took me awhile to figure it out too.